A senior Java developer builds robust, secure and efficient Java Applications which may include anything from complex back-end service groups to mobile counterparts. 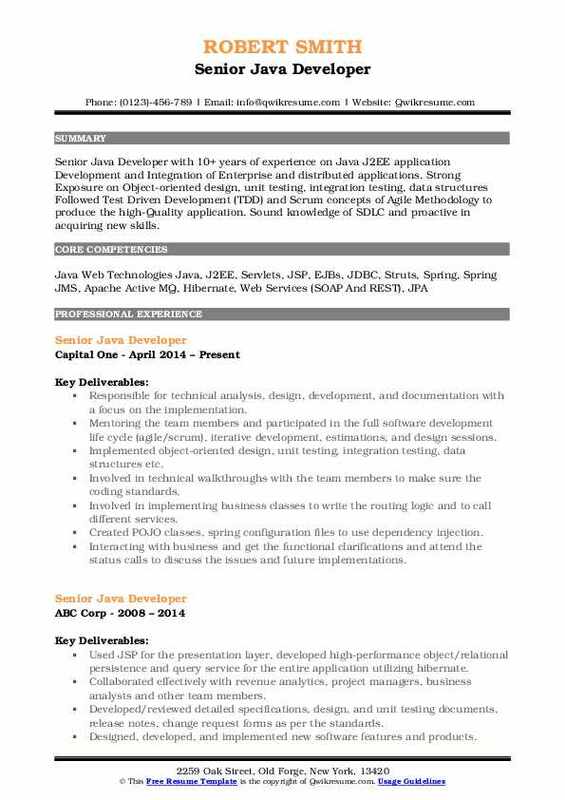 The primary roles and responsibilities to be highlighted in the Senior Java Developer Resume include – designing and developing Java applications, translating application storyboards, using cases into functional apps; designing, building and maintaining reusable, reliable and efficient Java code; ensuring best performance, responsiveness and quality applications; identifying bottlenecks, devising solutions for identified bugs, helping in maintaining code quality and supervising the other software developers. 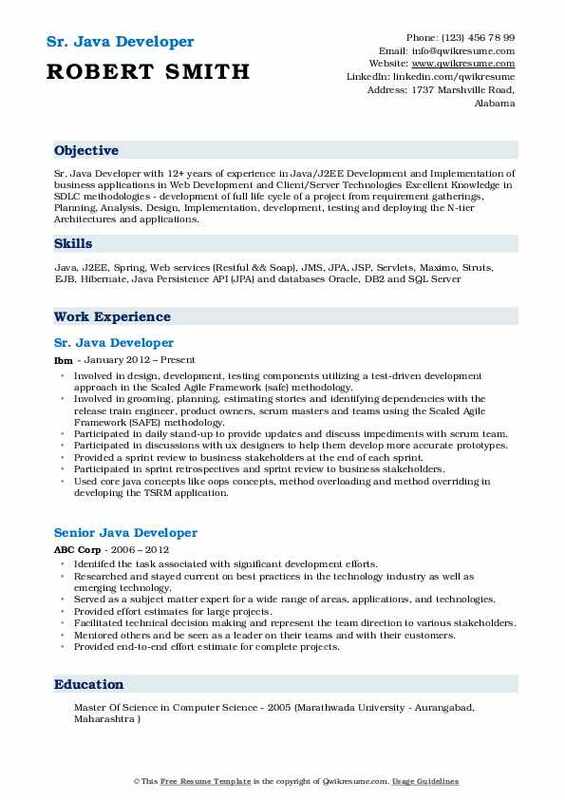 A Professional Senior Java developer emphasizes on skills like proficiency in Java, knowledge of concurrency Java patterns, experience with the web application framework, familiarity with concepts such as MVC, RESTful and JDBC; good understanding of Java GUI frameworks, a knack for writing clean Java code and a sound understanding of Java class loading mechanism. Most of the Senior Java developers embrace a Masters degree in Software technology or IT and also have a good managerial experience. 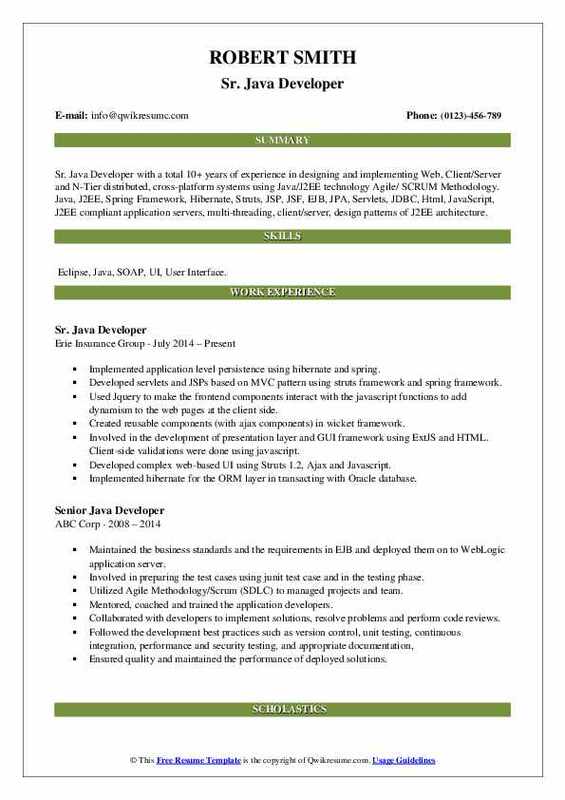 Summary : Sun Certified Senior Java Developer with 14 years of progressive experience in the IT industry, involved in complete SDLC including analysis, design, development, testing, implementation, support and maintenance of enterprise-level web applications using Java/Java EE technologies. Sound knowledge in Banking, insurance with leading clients including Key Bank, Franklin Templeton, Hewitt Associates etc. as a Sr Java Developer. Predicted emerging customer needs and developed innovative solutions to meet them. Solved unique and complex problems with broad impact on the business. Participated in the development of business strategy. Lead large, complex projects to achieve key business objectives. Translated highly complex concepts in ways that can be understood by a variety of audiences. Influences senior leadership to adopt new ideas, products, and/or approaches. Coordinates the cross-functional and/or cross-segment teams. Worked on multithreading and involved in thread creation and resource allocation. Learned svn repository usage, server management, and production level bug fixing. Undergone training and implementation which involved basics of software engineering i.e. software process model objectives, requirement engineering objectives, implementation, and testing. Summary : Senior Java Developer with over 8+ years of experience in software design, development, implementation and software engineering which also includes integration, maintenance and testing of various client/server, and web applications. 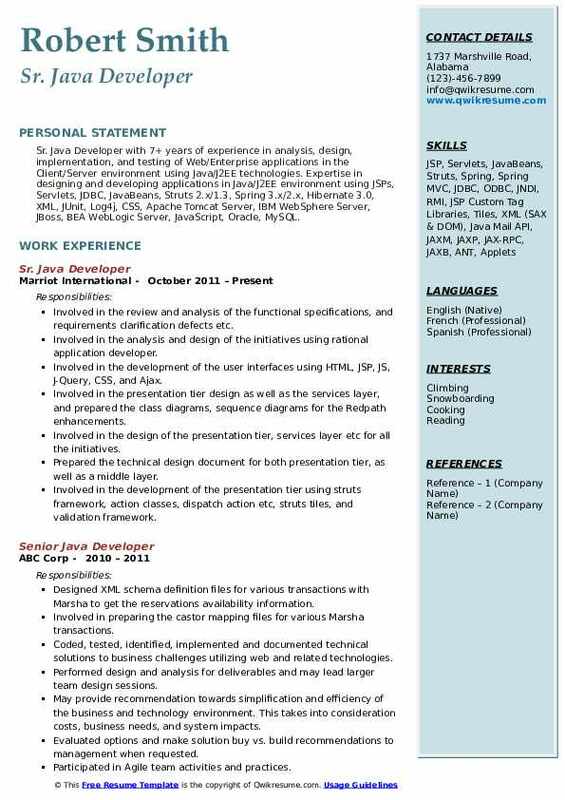 Design, development, and analysis in OO fields (Java, and UML), internet applications, Application Servers and Web Servers such as Oracle Web-logic Server 12c, IBM Web Sphere 5.0/6.0, JBoss Server 7.1.1 and Apache Tomcat 7, J2EE. 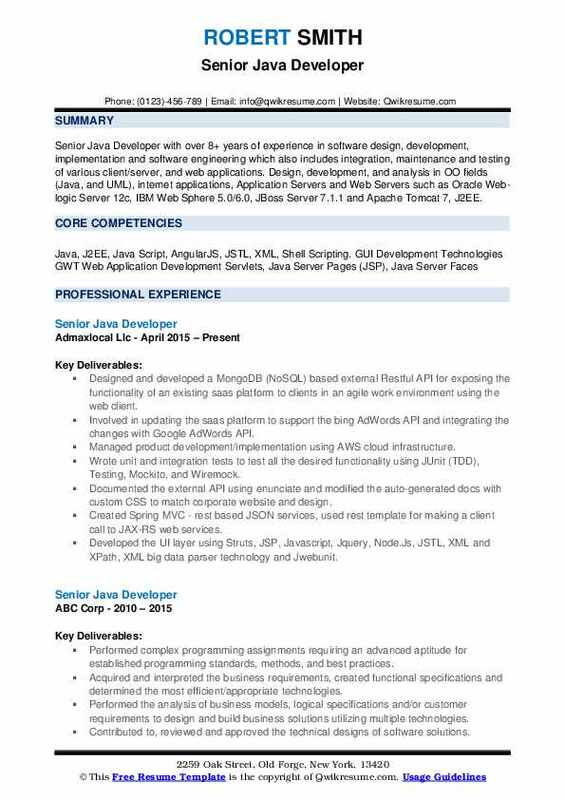 Designed and developed a MongoDB (NoSQL) based external Restful API for exposing the functionality of an existing saas platform to clients in an agile work environment using the web client. Involved in updating the saas platform to support the bing AdWords API and integrating the changes with Google AdWords API. Managed product development/implementation using AWS cloud infrastructure. Wrote unit and integration tests to test all the desired functionality using JUnit (TDD), Testing, Mockito, and Wiremock. Documented the external API using enunciate and modified the auto-generated docs with custom CSS to match corporate website and design. Created Spring MVC - rest based JSON services, used rest template for making a client call to JAX-RS web services. Established Continuous Integration (CI) practices and standards in creating apis with jira, jenkins. Involved in building and deployment of the application in a Linux environment. Maintained a necessary backup of the important files and documented linux scripts for future reference. Deployed application onto Jboss application server in CI environment. Skills : Eclipse, Java, SOAP, UI, User Interface. Created reusable components (with ajax components) in wicket framework. Involved in the development of SQL, PL/SQL packages, stored procedures. Created web services using WTP tool plugin to the eclipse ide which is deployed as a separate application using maven scripts. Used Endeca navigation queries to return set of records for a given store. Created new services for this feature which enabled other teams to reuse them. Monitoring program execution for expected performance using Dynatrace. Coordinating with functional team related to design part & keep track of all changes. Worked with SVN repository to handle the separation between code versions from existing project. Helping the Junior Developer in understanding the process & modifying requirements. Customizing the Experience Manager cartridges based on business user requirements. Setup/managing & maintaining the landing pages, keyword redirects, thesaurus messages & templates. Working with stakeholders following the Agile Scrum software development process. Involved in the review and analysis of the functional specifications, and requirements clarification defects etc. Involved in the analysis and design of the initiatives using rational application developer. Involved in the development of the user interfaces using HTML, JSP, JS, J-Query, CSS, and Ajax. Involved in the presentation tier design as well as the services layer, and prepared the class diagrams, sequence diagrams for the Redpath enhancements. Involved in the design of the presentation tier, services layer etc for all the initiatives. Prepared the technical design document for both presentation tier, as well as a middle layer. Involved in the development of the presentation tier using struts framework, action classes, dispatch action etc, struts tiles, and validation framework. Used vignette content management system for all the content required for .com, and global sites as well as partner sites such as Ritz, Execustay, and Bulgary. Summary : Sr. Java Developer with 12+ years of experience in Java/J2EE Development and Implementation of business applications in Web Development and Client/Server Technologies Excellent Knowledge in SDLC methodologies - development of full life cycle of a project from requirement gatherings, Planning, Analysis, Design, Implementation, development, testing and deploying the N-tier Architectures and applications. Involved in design, development, testing components utilizing a test-driven development approach in the Scaled Agile Framework (safe) methodology. Involved in grooming, planning, estimating stories and identifying dependencies with the release train engineer, product owners, scrum masters and teams using the Scaled Agile Framework (SAFE) methodology. Participated in daily stand-up to provide updates and discuss impediments with scrum team. Participated in discussions with ux designers to help them develop more accurate prototypes. Provided a sprint review to business stakeholders at the end of each sprint. Participated in sprint retrospectives and sprint review to business stakeholders. Used core java concepts like oops concepts, method overloading and method overriding in developing the TSRM application. Involved in enhancing and creating service using JAX-RPC and soap web services to create auto-ticketing in integration with other systems. Responsible for requirement analysis of all the web applications and understanding the client requirements. Involved in estimating the tasks, code reviews, defect tracking and resolving technical issues. Involved in high level and low-level design of all the web applications and contributed towards detail design specifications for the web applications. Implemented rest web service using spring rest for the core pricing application. Designed and implemented an application using JSP, Spring MVC, Spring IOC, Spring Annotations, Spring AOP, Spring Transactions and Hibernate. Created connections to a database using hibernate session factory, using hibernate APIs to retrieve and store data to the database with hibernate transaction control. Implemented persistence layer using various features of Hibernate 3.5 framework like HQL queries, criteria etc. Implemented caching using Ehcache in hibernate for the better performance. Followed all the coding standards and implemented the proper design patterns. 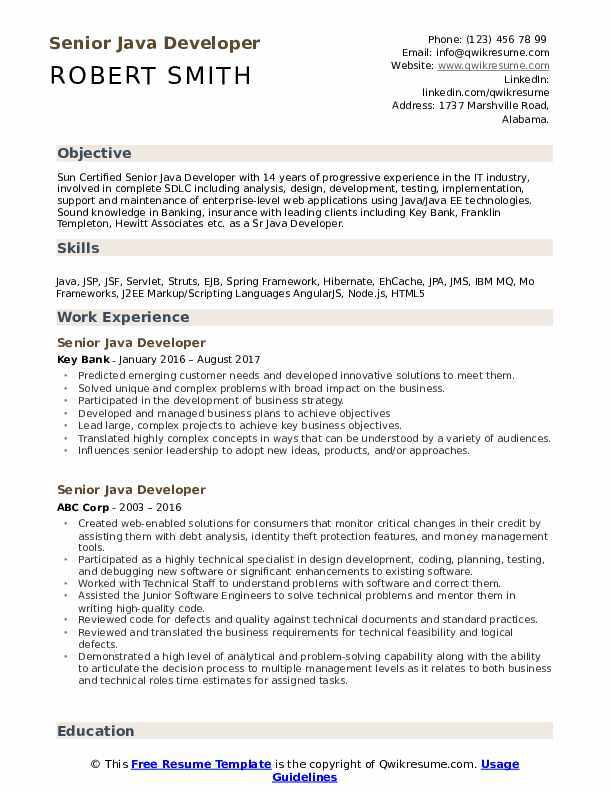 Summary : Senior Java Developer with 10+ years of experience on Java J2EE application Development and Integration of Enterprise and distributed applications. Strong Exposure on Object-oriented design, unit testing, integration testing, data structures Followed Test Driven Development (TDD) and Scrum concepts of Agile Methodology to produce the high-Quality application. Sound knowledge of SDLC and proactive in acquiring new skills. Responsible for technical analysis, design, development, and documentation with a focus on the implementation. Mentoring the team members and participated in the full software development life cycle (agile/scrum), iterative development, estimations, and design sessions. Implemented object-oriented design, unit testing, integration testing, data structures etc. Involved in technical walkthroughs with the team members to make sure the coding standards. Involved in implementing business classes to write the routing logic and to call different services. Created POJO classes, spring configuration files to use dependency injection. Interacting with business and get the functional clarifications and attend the status calls to discuss the issues and future implementations. Ensuring compliance with coding standards, source code control, version control, build & deployment procedures and performance tuning. 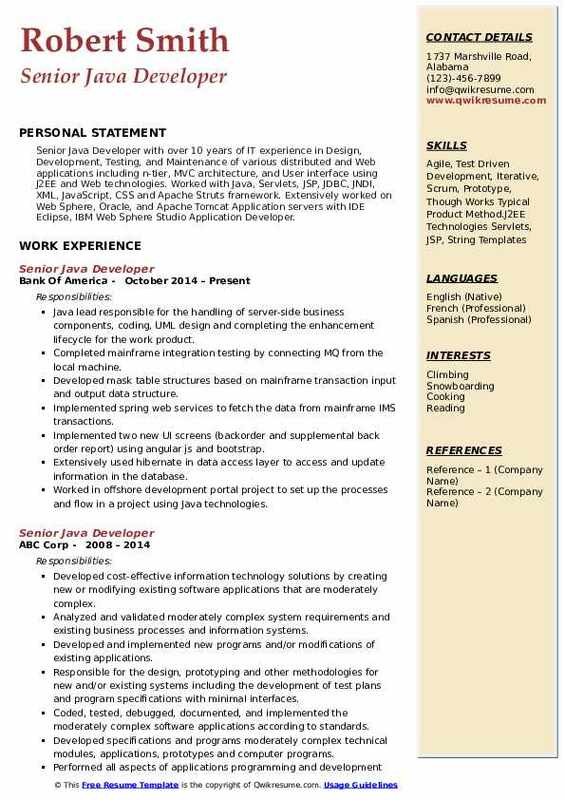 Java lead responsible for the handling of server-side business components, coding, UML design and completing the enhancement lifecycle for the work product. Completed mainframe integration testing by connecting MQ from the local machine. Developed mask table structures based on mainframe transaction input and output data structure. Implemented spring web services to fetch the data from mainframe IMS transactions. Implemented two new UI screens (backorder and supplemental back order report) using angular js and bootstrap. Worked in offshore development portal project to set up the processes and flow in a project using Java technologies. 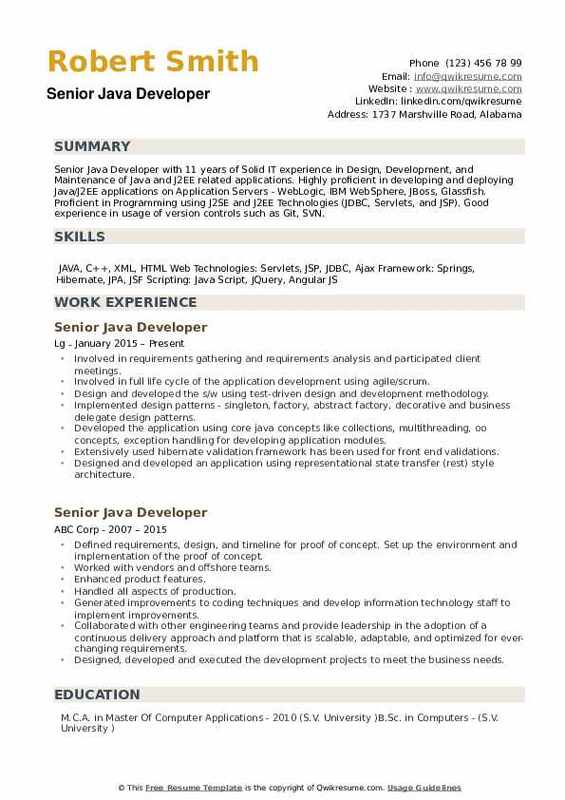 Summary : Senior Java Developer with 11 years of Solid IT experience in Design, Development, and Maintenance of Java and J2EE related applications. 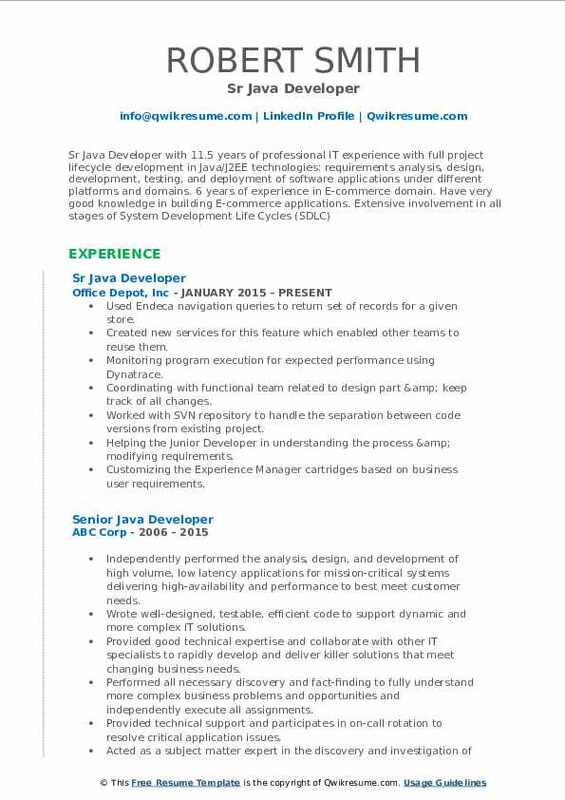 Highly proficient in developing and deploying Java/J2EE applications on Application Servers - WebLogic, IBM WebSphere, JBoss, Glassfish. 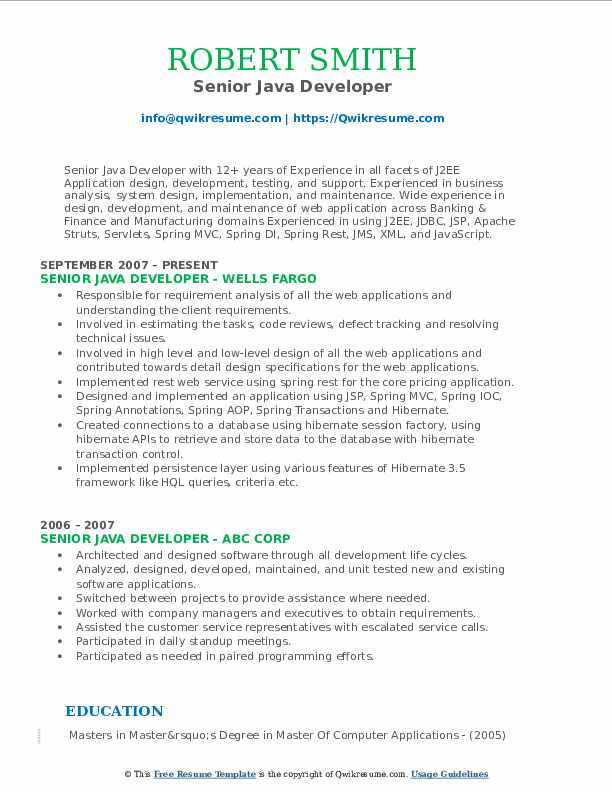 Proficient in Programming using J2SE and J2EE Technologies (JDBC, Servlets, and JSP). Good experience in usage of version controls such as Git, SVN. Involved in requirements gathering and requirements analysis and participated client meetings. Involved in full life cycle of the application development using agile/scrum. Design and developed the s/w using test-driven design and development methodology. Implemented design patterns - singleton, factory, abstract factory, decorative and business delegate design patterns. Developed the application using core java concepts like collections, multithreading, oo concepts, exception handling for developing application modules. Extensively used hibernate validation framework has been used for front end validations. Designed and developed an application using representational state transfer (rest) style architecture. Designed, developed and exposed all business functions as services using JAX-RS with jersey framework.